This competition was organized by the Garvald Website Team in support of National Poetry Day, 8th October 2015. We had a fantastic response with nearly eighty entries! The theme, as for National Poetry Day, was ‘Light’. The poems were sent as anonymous entries for judging and this year we were delighted to have Edinburgh-based Poet and Playwright Donald Campbell as our expert judge. Books, poetry postcards and book tokens were awarded to the winners. Donald very much enjoyed reading all of the poems and commented that he found the standard impressive. The results and Donald’s comments on the winning poems are below. We thank Donald for taking the time to judge the poems and our congratulations go to the winners. The winning entries have been published here (scroll down to read them) and will also be published on the Scottish Poetry Library blog for teachers. We are grateful to Georgi Gill, Learning Manager at the SPL, for her support and for arranging some lovely prizes. The Scottish Poetry Library has recently been refurbished and is well worth a visit if you are looking for a huge range of poetry all in one place. 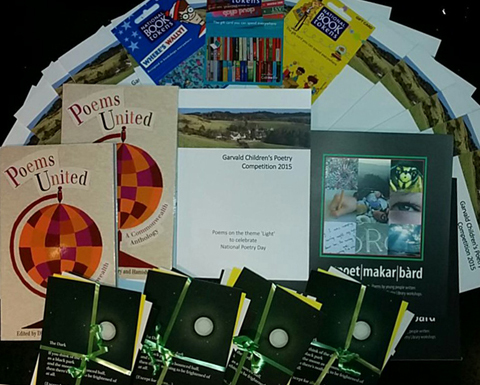 We would also like to thank Garvald and Morham Community Council for their support in funding generous book token prizes and the printing of competition poetry book, in which all entries have been printed. The animals are in their slumber. The sun is away for the very next day. Like diamonds sewn across black silk of the night. From the fire beneath the logs in my home. And resting my tiny fawn head. The lights of Edinburgh shine so bright. But not too bright that you cannot see. At the airport in the hospitals. Purple and green blue and red. Dots and lines stripes and checked. I hate living in the city. The moon is shining just as bright and all is well. But Jack said he was in Perth. So there was none in the park. And made her a light. So this world would be really bright. Also most of all goodbye Jack and Perth. Wishing the sun was out every day. Oh the sun, the sun, the sun. If you’d like to read all of the competition entries, they have been published in a PDF file, see Garvald Children Poetry Competition – All Poems 2015. Copies of this book can be read at The Garvald Inn and Haddington Library. Celebrating National Poetry Day (Thursday 2nd October, 2014).